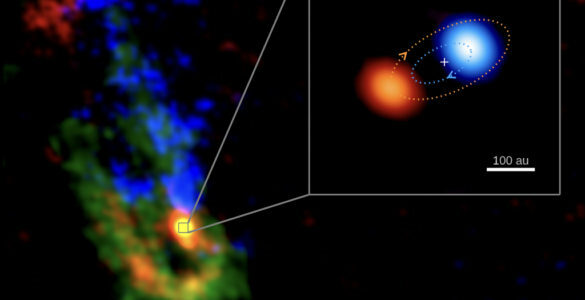 On April 5, 2017, a team of astronomers, engineers, and technicians attempted something unprecedented; they linked together a worldwide network of radio telescopes -- including the Atacama Large Millimeter/submillimeter Array (ALMA), with the goal of imaging the outer edges of a supermassive black hole. 2. What Is the Event Horizon Telescope? 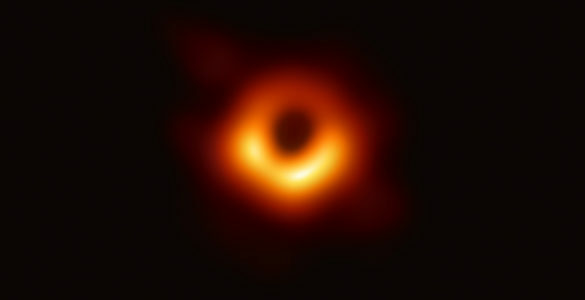 The Event Horizon Telescope (EHT) is a worldwide network of radio astronomy facilities linked together with the goal of studying one of the most exciting objects in the known universe -- the edge of a black hole. Supermassive black holes lurk at the center of all galaxies and contain millions or even billions of times the mass of our Sun. The light-bending power of black holes also presents a unique opportunity to observe the so-called “shadow” of a black hole. Taking a picture of the event horizon surrounding a supermassive black hole requires both resolution -- seeing fine details -- and sensitivity -- teasing out actual data from a very weak signal. But the ALMA-enabled EHT can do both! 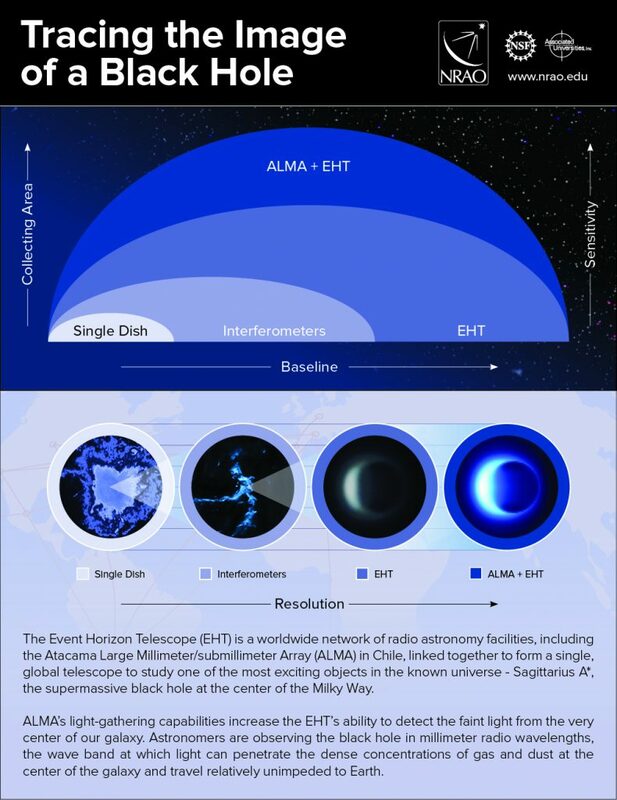 ALMA was designed to work as an interferometer -- but that type of telescope is incompatible with the EHT. 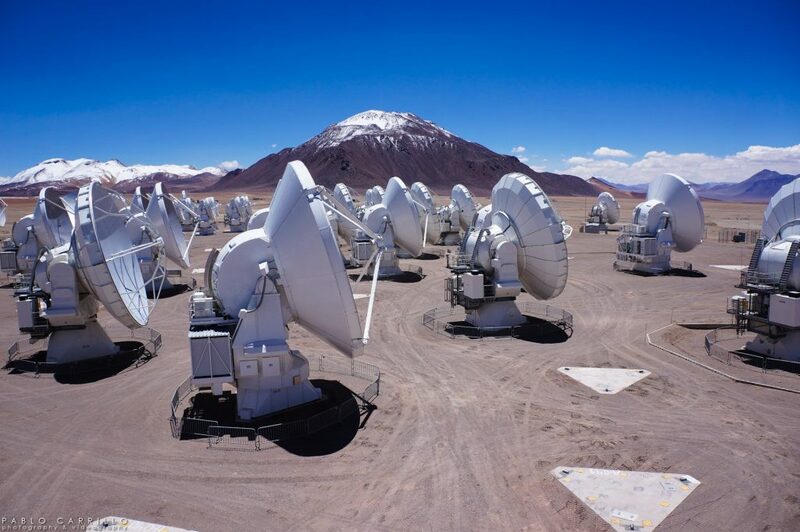 Recently, astronomers upgraded ALMA so it could become a phased array. On April 5, 2017, a team of astronomers, engineers, and technicians will attempt something unprecedented; they will link together a worldwide network of radio telescopes — including the Atacama Large Millimeter/submillimeter Array (ALMA), with the goal of imaging the outer edges of a supermassive black hole. Black holes are reality-bending concentrations of matter in space. They can be forged when star at least five times the mass of our Sun dies a spectacular death in a supernova explosion. The collapsing core from this explosion becomes so dense its gravity prevents even the fleeting particles of light from escaping its grasp. 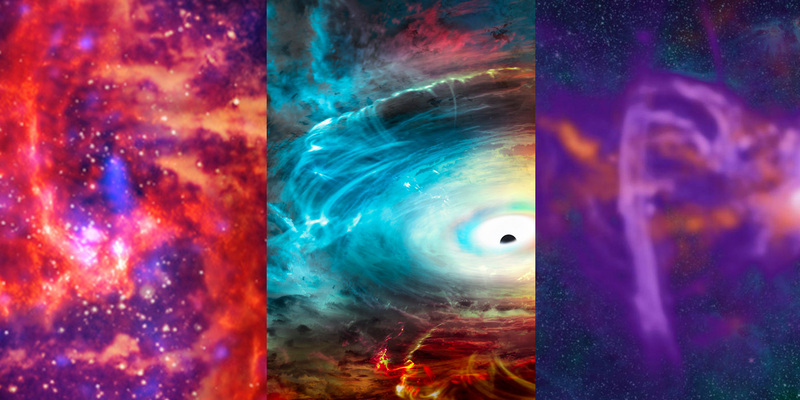 Other black holes, millions to billions of times more massive than our Sun, reside at the centers of galaxies. These supermassive black holes exert tremendous influence on their home galaxies, especially when they gorge on gas and stars. Though astronomers have long studied the impact of black holes on the universe, no one has ever imaged the actual point of no return, where matter and energy cannot escape a black hole — the so-called event horizon. By combining the collecting area of ALMA and other millimeter-wavelength telescopes scattered across the globe, the EHT may finally achieve that goal. To learn more about radio telescopes, arrays, and the key to the EHT — Very Long Baseline Interferometry — read here. Additional details are on the Joint ALMA Observatory website and the ESO website. The supermassive black hole at the center of our galaxy is hidden behind dense clouds of dust and gas. With the combined power of a worldwide network of radio telescopes, astronomers hope to peer into the heart of our galaxy and image -- for the first time -- the very edges of a black hole. When this network observes radio waves of one millimeter wavelengths, its magnifying power is high enough to see details at the black hole boundary. The Event Horizon Telescope (EHT) is a worldwide network of radio astronomy facilities linked together with the goal of studying one of the most exciting objects in the known universe — the edge of a black hole. The EHT derives its extreme magnifying power by connecting widely spaced radio dishes across the globe into an Earth-sized virtual telescope. This technique, called Very Long Baseline Interferometry (VLBI), is the same process that enables telescopes like the Very Long Baseline Array (VLBA) and the Atacama Large Millimeter/submillimeter Array (ALMA) to achieve such amazing power and resolution. 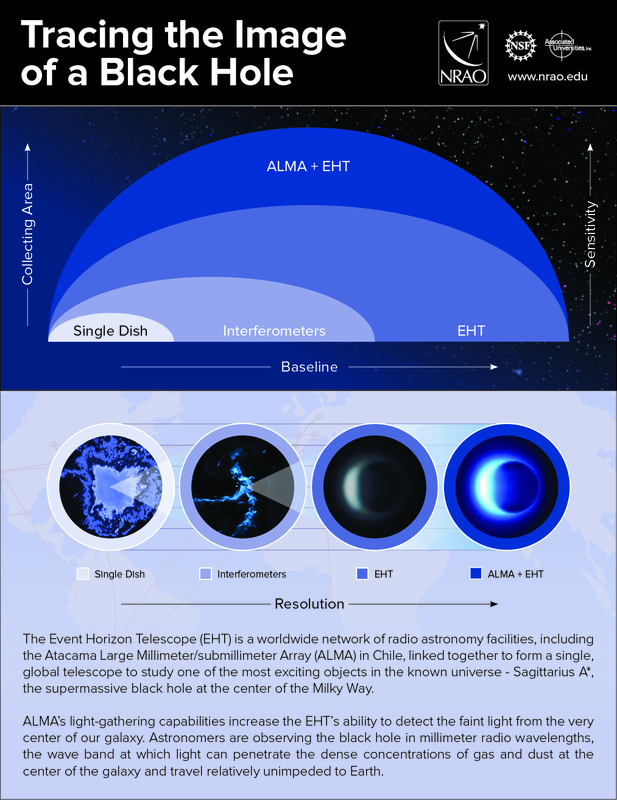 The difference between existing VLBI facilities and the EHT is the sheer geographical scope of the EHT project, its extension to the shortest observing wavelengths, and addition of the unprecedented collecting area enabled by ALMA. The EHT will observe the center of our galaxy at a wavelength of 1.3 millimeters. This particular wavelength is essential to peer into the otherwise obscuring veil of dust and gas near the center of our galaxy. The telescope will achieve an astounding resolution of 10 – 20 microarcseconds — which is the equivalent of reading the date on a coin in Los Angeles from the distance of New York City. 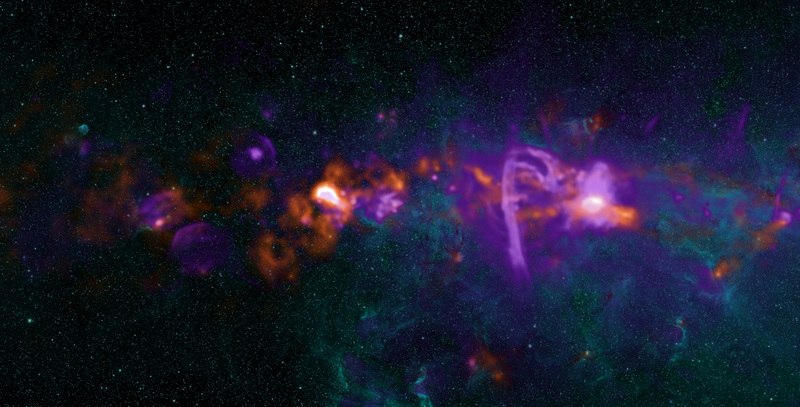 The center of our galaxy, as seen with the VLA, Hubble, and Chandra. The view of the center of our galaxy with a closer view of the object known as Sagittarius A*, the bright radio source that corresponds to the supermassive black hole. The center of the ALMA array on the Chajnantor Plateau at 5,000 meters. Obtaining an image of a black hole is not as easy as snapping a photo with an ordinary camera. The supermassive black hole at the center of our galaxy, called Sagittarius A*, has a mass of approximately four million times that of the Sun, but it only looks like a tiny dot from Earth, 26 000 light-years away. To capture its image, amazingly high resolution is needed. By combining the data collected by antennas thousands of kilometers apart, VLBI achieves a resolution equivalent to a radio telescope several thousands of kilometers in diameter. However, VLBI also has a lot of large blank areas that are not covered by any of the antennas. These missing parts make it difficult for VLBI to reproduce a high-fidelity image of a target object from the synthesized data. This is a common problem for all radio interferometers, including ALMA, but it can be more serious in VLBI where the antennas are located very far apart. The observations with the EHT and the GMVA were completed in April 2017. The data collected by the antennas around the world has been sent to the United States and Germany, where data processing will be conducted with dedicated data-processing computers called correlators. The data from the South Pole Telescope, one of the participating telescopes in the EHT, will arrive at the end of 2017, and then data calibration and data synthesis will begin in order to produce an image, if possible. 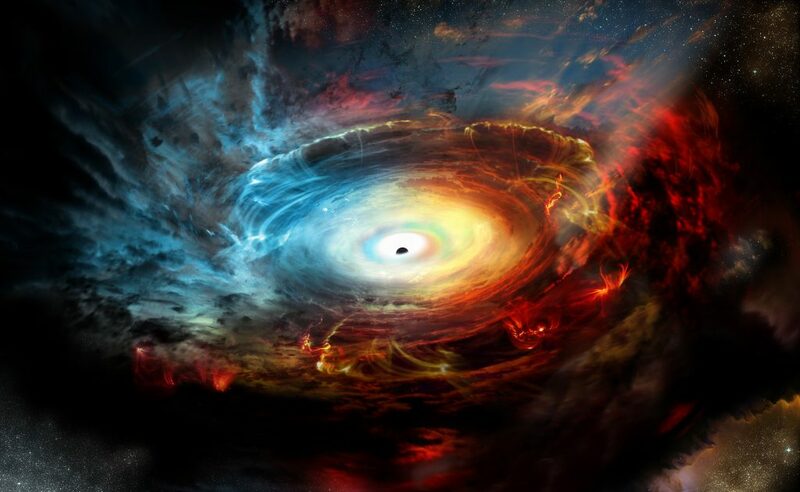 This process might take several months to achieve the goal of obtaining the first image of a black hole, which is eagerly awaited by black hole researchers and the general astronomical community worldwide. ALMA’s light-gathering capabilities increase the EHT’s ability to detect the faint light from the very center of our galaxy. But before ALMA could join the Event Horizon Telescope network, it first had to transform into a different kind of instrument known as a phased array. This new version of ALMA allows its 66 antennas to function as a single radio dish 85 meters in diameter. It’s this unified power coupled with ultraprecise timekeeping that allows ALMA to link with other observatories. A major milestone along this path was achieved in 2014 when the science team performed what could be considered a “heart transplant” on the telescope by installing a custom-built atomic clock powered by a hydrogen maser. This new timepiece uses a process similar to a laser to amplify a single pure tone, cycles of which are counted to produce a highly accurate ‘tick’. Shep Doeleman, the principal investigator of the ALMA Phasing Project, participated during the maser installation via remote video link. “ALMA will use the ultraprecise ticking of this new atomic clock to join the aptly named Event Horizon Telescope as the most sensitive participating site, increasing sensitivity by a factor of 10,” he said. To add the signals from all the antennas, specialized electronics and computer equipment were built at the National Radio Astronomy Observatory’s Central Development Lab in Charlottesville, Virginia. These new circuit boards were installed into ALMA’s correlator, the supercomputer that combines the signals from the antennas. During the upcoming observations, the signal from the phased array will be time-stamped and encoded by a dedicated atomic clock. This will allow the data to be shipped to a central processing center where it will be combined with identically timed signals from other telescopes. The high-speed recorders that will capture the torrent of data flowing from the ALMA phased array were designed by the MIT Haystack Observatory. Software to run the new phasing system was developed by multiple institutions involved in the phasing project.